"We typically expect a 10 to 15 percent decrease of loss severity with a short sale"
- Dave Sunlin, Senior VP, Foreclosure and Real Estate Management, Bank of America. It's true - since the peak in July, 2006, values nationwide have retreated more than 30%. In some of the hardest hit areas - well over 50%. Lenders lend money. Servicers collect money. They both own pieces of paper - legal documents. Amidst their cubicle farms and data centers they never made space for landlords, property managers and property sales agents - a full scale REO department - to manage defaulted-on collateral. When the mortgage payments stopped, lenders foreclosed. (They're not exactly out-of-the-box thinkers.) That hasn't worked out so well for them. Starting last year, they started going "Short Sale" route more frequently... Short Sales nearly tripled year-over-year in the first half of 2009. Fact is - as BofA has acknowledged - they lose less when they opt for a Short Sale instead of foreclosure. Profit is always a good incentive for a banker. As of April, 2010, they'll also be "incentivised" by the Treasury Department. They're now REQUIRED to consider the Short Sale option for certain defaulting borrowers. No one is denying the big problem with under-water mortgages and defaulting borrowers. And the Short Sale solution is often the best option. So you'd think lenders would make it easy. You see, lenders make it so obtuse, byzantine and slow for the average home owner and Realtor, that few are successful. Just ask any Realtor who has tried to do a few Short Sales. It's like being water boarded to them. I have 3 interviews with seasoned pro's in the Short Sale niche. They each have their business running like a smooth, perfectly oiled machine. And what's so sweet (and surprising) is they don't personally deal with those bureaucratic lenders. Josh Cantwell is a Real Estate Investor, author and coach. He transitioned out of the corporate world into the Real Estate Investing world and strategically chose Short Sales as his niche back in 2003. He's in the Cleveland area which was quicker than the rest of the nation to spiral into defaults. He saw the writing on the wall and chose the Short Sale niche as a great way to profit from the change in market conditions. Josh has done over 500 Short Sale transactions. "I found them excellent. I have done approximately 50 short sales, albeit, 5 years ago, and I have to admit, I learned some fantastic new techniques and new knowledge. I have learned that a lot has changed in a short period of time. Listening to new techniques from different perspectives is priceless. I would recommend these to anyone and everyone." "I really liked how these interviews are very detailed. I hear about short sales all the time and how real estate agents don't like to work with them, and these interviews explain why as well as providing a solution for the agents' problems creating a win-win situation. I highly recommend these interviews and if you are or know an agent that absolutely hates or avoids short sales, have him/her listen with you. Hopefully they can be your "rock star" agent." "I began working in the real estate industry in 2008 soon after I was laid off from my job as a cabinetmaker. I studied to become a licensed real estate agent and quickly went to work for an agency in New York City - just as the housing subprime crisis began to take hold in the northeast. The market for real estate declined and listings and sales virtually dried up, so for about 18 months there was virtually NO money to be made, except for a nominal rental market that helped pay the rent and nothing more. It was in the second half of 2009 when I began to look into the little known (in NYC) shortsale market. I was introduced to several investors that were negotiating shortsales and I quickly saw the potential to make money in this area. With some help from these gentlemen I worked my way through my first shortsale in about 8 months - not exactly a moneymaking machine ! 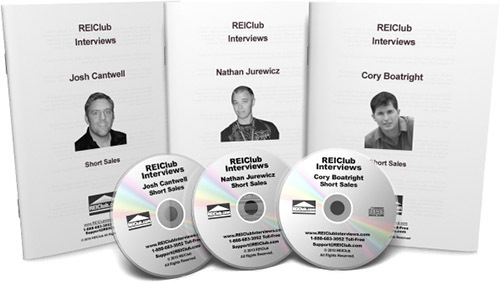 Then I came across REIClub and their new short sales interview series CDs. 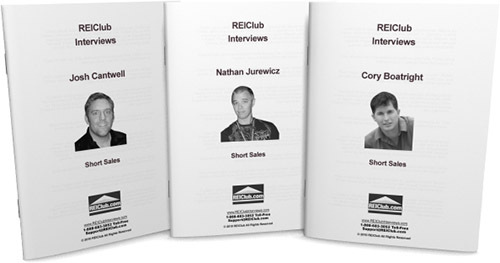 Believing that there is money to be made in short sales, especially since the real estate market seems to have stalled, I ordered the REIClub interview series on short sales, consisting of 3 CDs with short sale professionals Nathan Jurewicz, Cory Boatright and Josh Cantwell. I knew there had to be a better way to navigate through the short sale process, and I hoped this series would guide me to it. My hopes became reality when I received an approval on my next short sale offer within 4 weeks - thanks to the advice that helped me streamline the entire short sale process and take me straight to the negotiators able to make a quick decision on the deal. I am also very close to completing 2 more deals, and because of this success I have several other property owners reaching out TO ME! I have recently begun my own company designed to negotiate short sales for homeowners, using the advice from the REIClub short sales interview series. Thanks to REIClub and the interview series it seems I will finally benefit from the current real estate downturn, while also helping struggling homeowners get out from under the weight of a terrible situation without the stigma of having been foreclosed on." Nathan Jurewicz had a J-O-B and didn't offer much resistance when his friend dragged him to a Real Estate seminar. He was hooked. He started rehabbing in the Tampa area when the market was on the incline and put on the brakes when the market started stalling. He changed gears to Short Sales. He closes 5-10 transactions a month - working part-time - "without talking to a buyer, seller, or banker or looking at a house". Oh yea, he's still in his 20's. "Here's a newer investor (Nathan Jurewicz) sharing his system without pushing his "product"... Keep finding these kind of investors who'll share... Love that you transcribed it, too. Interviewer could be a little more organized to help focus the speaker. However, my questions were answered so the interviewer did a good job." "The interviews with short sale experts Josh Cantwell, Nathan Jurewicz and Cory Boatright were very helpful in getting a handle on the subject. As always, the dual format of audio CDs that I listen to in the car, along with accurate written transcripts and the one page interview nuggets make the information maximally accessible. The information is applicable to both those who want to set up a full time short sale business as well as those who only occasionally acquire a short sale deal. I plan on referring to the interviews regularly as I increase the proportion of my real estate investing that comes from short sales. Particularly useful is the the approach to take with realtors, the approach they should take with sellers, how the process works and the expectations of how much you can expect to make on a deal." "Timing! I was about to start working on short sales in the MLS with my Buyer's Agent, when the Short Sale Interviews appeared. I knew so little before that I couldn't even have asked enough questions to get all the information in them. There was a wonderful amount of important and easy to understand detail as well as three different overviews that were helpful. I was able to send some of the procedure information to my agent, who is new to this also so we can work together efficiently. Also, it was a real confidence builder for me now that I know the nitty-gritty. I hope this will give me an edge when dealing with the banks." Cory Boatright left High School for an entrepreneur education. After a few successes he set his sites on "making it" in Real Estate. He started Bird-dogging it, moved on to assigning, then wholesaling and ultimately really dug in with Short Sales. He's a speaker, author, trainer, radio show host and consultant. He and his wife own a national loss mitigation company. "My name is Jessica Ehmke and I live in Milwaukee, WI. I found all of the dvd's to be very informative. They are very thorough about going through the short sale process in a very detailed, easy to follow method. In today's market where there are record numbers of houses going into foreclosure every day, all of this info on here is priceless. To be able to navigate a sale before it actually goes into foreclosure will not only net me more profit in most instances, but I will get the satisfaction of being able to help homeowners keep a foreclosure off of their record. It seemed unbelievable to me that the banks would be willing to take such a huge loss on a property, but hearing their stories makes me see that it does happen every day. Finding out that they started in this business not knowing anything about the short sale process, and have since turned into experts in that field gives motivates me to get started focusing more on short sales. I like the fact that all of these guys are just normal people who have found their niche in the real estate world, and are taking the time out of their busy schedule to help educate others so we can find success also. Thank you for selling a quality product at a very reasonable price!" "I was amazed at the information contained within these three interviews. These guys lay out the basic overview of the short sale process and introduce you to how to start up your own real estate business. They describe the teams they have put together and what to look for when you put your own team together. Overall, a very educational package." "I'm new to investing so all the info on short sales in the REIClub interview series was very eye-opening and informative. I believe it will give me a great starting point to work from and I already have a potential lead on a short sale. Thanks much for the great info." These strategy and tactic-dense interviews will come to you in a 3-CD set... listen from your computer, your car, your portable mp3 player or wherever. If you haven't heard my interviews before, let me assure you, they're not the typical lite-on-content, heavy-on-pitch. In fact, there's no pitch at all. They're pause and rewind, detail-dense, real-world lessons. I carefully prepare for each interview. I probe deep on the important aspects and keep each guest focused and on track. The quality of the content is as good or better than $1,000+ private seminars. But it won't cost you seminar prices. I"m so confident that you will love this powerful real estate investing information that I"m willing to bear 100% of the risk for the next 30 days. That means that you can get in now plus get all the bonuses RISK FREE and give it a shot for 30 days. If you aren"t happy for any reason simply let us know and I"ll immediately cancel your order and I"ll even let you keep all the bonuses as my way of saying thank you! But Wait! Let Me Make This Even Easier For You! Some people learn best with audio. That's no secret. Some learn best visually. That's no secret. But the most powerful way to make something second nature, to fully integrate powerful, profit making ideas into your brain, so you can recall them on command, is to use multiple senses to digest the information..
You'll have the transcripts to read over, scan and skip through, study and markup with notes to easily review when you need that clarification or re-introduction. ...because when you're done, you'll have a mind like a steel trap, full of the best money making ideas in Real Estate today! Wish you had someone to do some of the work for you? Now you will. Your VA will work for you up to 40 hours and there will be absolutely no cost to you. We hear you. One of the top complaints we hear from Investors is not having enough time to get everything done. We know doing everything yourself can slow you down and we want you be successful fast rather than slow. We've added this bonus so you get your system running quickly and you can focus your time on the high value stuff. Focus, they say, is like a laser beam. Each interview has a handful of critical points. I've pulled them out for you and had them printed separately so you can easily grasp and review them at any time. These little cheat sheets reveal the most important focus points from each expert. Read over them before listening to the interview to prepare your attention and again after the interview to cement those important points in your memory. You get complete access for one full month to the deepest - and growing - Real Estate Investing library available today. REIClub Pro has over 140 multi-media trainings available on every Real Estate Investment topic imaginable. Plus a full array of forms and resources to guide you through business building and real estate transactions. I pay your dues for this state-of-the-art wealth building University the first month where you can get a professional education that could mean tens of thousands of dollars for your business! And if you find out you can't live without it - as so many others feel - you'll simply invest a modest $39.95 per month to keep it coming non-stop. New content is added monthly. The first month is on me. You can cancel any time, without obligation. But I can't say that many do - this is one of the best values in Real Estate Investing available today! This book by Napoleon Hill is widely known as a personal and business development masterpiece. At Andrew Carnegie's request, Hill studied the characteristics of highly successful people for over 20 years and noticed certain "laws of success". This book is based on those principles and many, many successful individuals of our time credit their successes to this book. What are you waiting for? Grab these expert interviews now and be delighted to see how easy - and stress and risk free - it can be to build your wealth and realize your dream lifestyle. Talk about a personal stimulus plan. Don't wait. Grab these powerful interviews now. P.S. We reserve the right to change or remove this offer at any time. Some 3 CD sets have sold previously at $97. Please note this is the lowest price at which this offer has ever been available and we make no promises this price will be available the next time you return. Yes, I Want These Interviews Now!